The Font capabilities of My-T-Pen are limited for a variety of reasons. These limited options have only been included as a specific solution for a small subset of customers. Use My-T-Pen Build-A-Board for more complete control over the appearance. Sizes 1-6 are the Base sizes. For almost all uses, the MyTMouse font is the best choice. Each button selects the corresponding size range font. 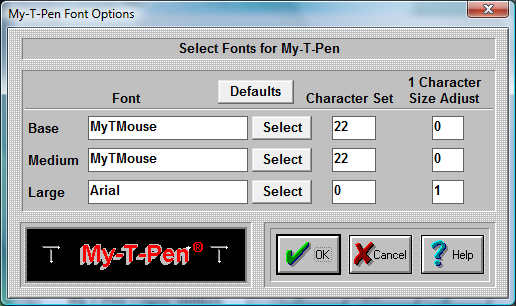 A System Font Selection dialog is available to select from installed fonts. Only the (Font) Face Name is preserved. This setting refers to the amount subtracted from the available area of the key (total pixels) used to display the font character. Even though it strongly affects key displays of 1 character (i.e. alphanumeric keys on the Keyboard (Alpha) panel), it does have some effect on all buttons displayed. In some ways, this is similar to the Key border concept in Operation Options - the only use for this value is in calculating the best point size for the key display.